Written by Jin Won Choi on Oct. 15, 2017 in Interviews, Real Estate. Last update on Oct. 16, 2017. The following is the transcript of the conversation I (Jin Choi) had with Seth Daniels, who is the managing partner of JKD Capital. JKD provides research and analysis to the Libertas Real Estate Opportunity Fund, a fund for accredited Canadian investors dedicated to protecting against a downturn in the Canadian housing market. Jin: Could you start by introducing yourself? Seth: Sure. I’ve been in the hedge fund business since 2000. I started off working for one of the pioneers of growth investing at the tail-end of the dot com and biotech bubble. That’s where I gained my first experience in both growth investing (particularly at the end of a cycle) and short selling. From there I went to work for a short selling consulting firm that’s famous for publishing on Enron—that’s really where I first learned the trade of short selling. J: How long were you there? S: Maybe a year and half. I then went to work for one of my former bosses from my first firm who had started a healthcare hedge fund. I became very negative on the US housing market in 2006 and moved to a macro fund in Boston. I started my own firm about 5 years ago. J: That was good timing on your part on the us housing. S: Yeah, obviously the timing was partly luck. It’s nearly impossible to time the collapse of a bubble. S: There were lots of indicators but that doesn’t always mean that your timing’s going to be right: short sellers are generally early. So I saw a lot of things that indicated that it was ending but that didn’t necessarily mean it needed to end right there… if the central banks had printed money then the way that they are printing money now, the bubble could easily have continued for a few more years. J: What were some of these indicators that you saw with the US housing market? S: Well, it was obviously a bubble. But in terms of timing, there were a couple of things. One of the big ones was something called first payment defaults and early payment defaults. People were missing their first or second or third payment on a mortgage. If you take out a mortgage and miss your very first payment on that mortgage, that’s a problem. That generally means that you’re either loaning to people who can’t afford it or it’s fraud or some combination of those two. J: Is that different from the delinquency rate? S: It’s a subset of the delinquency rate. So the delinquency rate will cover all of your delinquencies; this is just looking at the first payments that people are missing right after they sign the mortgage. S: So let’s say you go out and you buy a house today. Next month you have to make your first mortgage payment. You miss it. Delinquencies can happen at any time over the course of a mortgage period. So if you have a 30 year mortgage, you can go delinquent at any time over the thirty years. 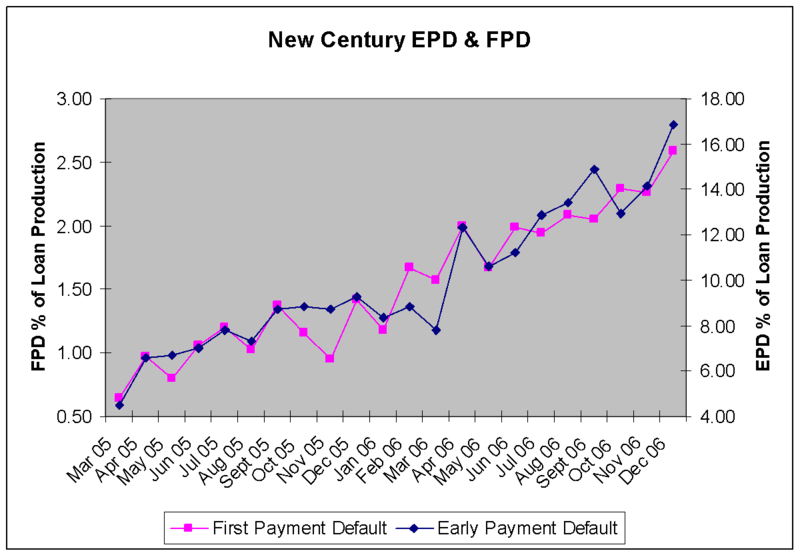 First payment defaults and early payment defaults just refers to a particular subset of that. So if you’re missing your first payments or payments over the first year of the mortgage, there’s a very serious problem. Seth’s note after our interview: I don’t have my original data handy, but here is a chart that my friend @donutshorts put together from the New Century (a failed subprime lender in the US) autopsy. J: So, you got to see the US housing market burst. You also saw a few other housing markets burst. They all happened around the same time. S: I did. I saw Iceland’s first-hand, and I was less involved in the Irish and Spanish bubbles but followed them. J: Were they different from the US? S: Yeah they were obviously all different, but the same at their core. Every bubble is different, and that’s one of the things that people get hung up on. It’s a cliché, but people living in the midst of a bubble think “it’s different here” and “it’s different this time”. They say well, here are all the differences between X and Y. And they generally have convincing sounding reasoning for those differences. No two economic scenarios at any point in history are ever going to be identical so there are always going to be differences. The economy in Iceland was completely different than that of the United States, and the same could be said about Ireland and Spain, and the laws involving the mortgage market and the structure of the housing and mortgage market were different, and the specific factors allegedly driving the bubbles were different. People like to focus on the differences between the bubbles when they say, well listen, we don’t have a bubble here in Canada because we have recourse, we have mortgage insurance, we don’t have MBS and CDOs, we have all these factors that are different, right? And so they focus on these differences which are superficial at best or worse yet mistaken, and they never look for the common threads between the bubbles. J: Right, so what were some of the biggest differences that people were touting between the US and the Irish and the Spanish bubbles? S: People forget that Ireland had very stringent recourse laws. So what that means is that if you default, essentially what they have is almost like a modern day debtor’s prison where the banks can go after you, and you can’t just walk away from your mortgage. And so the idea was that because of that, people weren’t just going to walk away from their house. But it doesn’t really work that way. J: I see. And what about Spain? S: You know, I don’t remember specifically what people said was different about Spain at the time. On paper, the Spanish economy along with Ireland had been some of the best performing European economies for probably 15 years straight prior to the crisis. 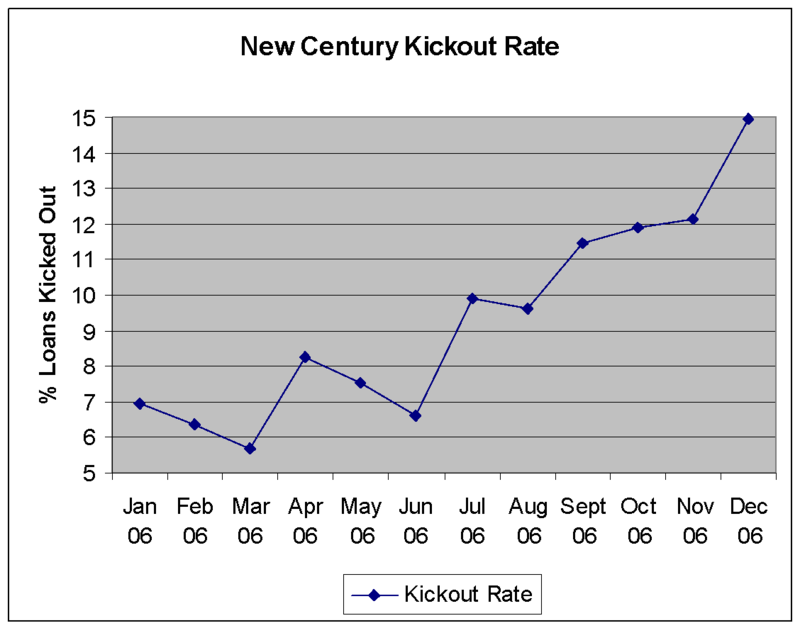 Spain had benefitted from a surge in immigration over this time as well. And finally, there was “limited beachfront property” and “nice weather” and the factor that all the Europeans wanted vacation homes in Spain. J: I see. So some of the drivers behind the housing market were different in Spain. J: Right. Just desirable so everyone will buy it. There’ll always be people who want to buy it. J: Okay. And what were the common themes among all those housing markets that you felt were not emphasized enough? S: By far the biggest common thread for most bubbles historically has been an outsized growth of debt. You can look at that in a couple of ways. You can say, is debt growing significantly faster than GDP or the savings rate? That generally shows that there’s a disconnect, and that’s one of the main things I look for in a bubble--when debt growth goes parabolic and as a result prices disconnect from the fundamentals. So debt growth is a huge one for me - that’s one of the main things I look for. The question is then timing and path—how much crazier can the credit bubble get. Have you sucked in all of the worst borrowers? How much worse can credit quality and underwriting get? Then the other thing is the general psychology of the market. Near the peak of the bubble people think it can’t ever go down for X, Y, and Z reasons. People think that even if it goes down in Ireland or the US, they think it won’t go down in Spain or vice versa, and so you have this euphoria and this idea that it’s different this time and it’s different in this place or whatever, and that’s one of the hallmarks of a bubble. Generally, if you say it’s a bubble, people take it very personally and they get very defensive and attack the skeptics and that’s another sign post. J: Right so how do you gauge investor sentiment? Do you rely on survey reports? S: No I don’t. I just talk to a lot of people and read a great deal. In Canada, I spend a huge amount of time talking to Canadians. The number of people who think that there’s a housing bubble or problem is a tiny percentage of the people I talk to. J: Really? Even in Canada? S: Yeah. Particularly in Canada. J: So I’m assuming that you’ve seen the other two bubble conditions in the Canadian housing market. 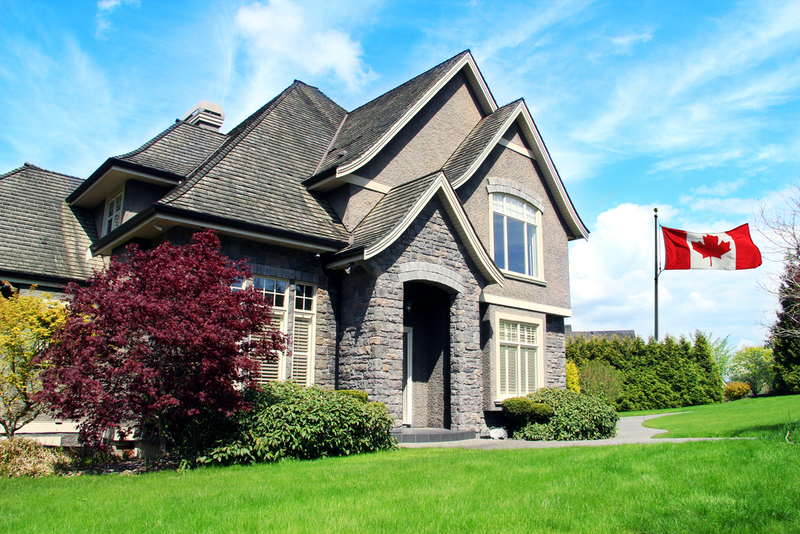 Are there any other reasons why you’ve chosen the Canadian housing market in particular? S: Those are the two primary reasons. The other factor in Canada is the inflow of foreign money that is itself driven by gigantic debt bubbles abroad. So for example, China I think is the biggest debt bubble that the world has ever seen, and that has added fuel to the fire of the Canadian bubble. The US bubble in the early 2000’s wasn’t as driven by the Chinese debt bubble back then as Canada is today. Canada today in some ways is probably more similar to the US housing bubble that was driven by hot Japanese money flows in the 1980s. J: Now, do you think the flow of Chinese money is stopping? I’m just asking this because I read an interesting Business Insider article today that said that the outflow from China has drastically decreased in the past couple months. S: I think that that is generally true although no one really knows for sure and I wouldn’t underestimate the ability of Chinese citizens to work around capital controls. It’s very difficult to track the flows cleanly. My sense is that from my research it’s true that the flow of Chinese money has slowed significantly over the past, say, 6 months, and will probably continue to slow as China puts in place increasingly strong capital controls. J: The Chinese money in particular has concentrated not everywhere in Canada but in 2 markets in particular, as in Vancouver and Toronto. Is it your sense that the housing market is overvalued in just those 2 markets or is it overvalued everywhere and it’s just more extreme in those markets? Or do you have another opinion? S: I think it’s overvalued everywhere. We had a similar debate in the United States. You can go back and look at the headlines at the time where people including Ben Bernanke and famous economists said that “real estate is local” and that while there were some pockets of overvaluation it’s impossible to have a national housing bubble. Obviously real estate is local. There are local supply and demand factors in housing, and they will be different in Vancouver versus Montreal. There are parts of the country that didn’t really go up at all, so there is truth to that, of course, as well. What the analysis misses, however, is that there are certain factors that affect all real estate in a given country at the same time, despite the fact that under normal circumstances real estate is primarily local. Obviously as we saw with the US, it is possible to have a national housing bubble, and the reason for that is the way that the financial system works, everyone in the entire economy is governed by the same interest rates set by the central bank. If that interest rate is set too low it will distort the entire economy and outweigh the location-specific housing factors. And in Canada today there is an additional country-wide factor: government mortgage insurance is nationwide and distorts all of the housing markets in the country. So interest rates and CMHC governmental mortgage insurance are two major factors that are not local at all. As a thought experiment, ask yourself what would happen to real estate across the entire country if interest rates doubled and CMHC backed away from insuring mortgages. When you’re in an extreme bubble like we had in the States and I think we have in Canada now, the macro drivers of interest rates, and in Canada, the government mortgage insurance, are nation-wide and not local, and therefore they can create a general housing bubble. Now the areas that had the most price appreciation that are the most expensive are likely to go down the most when housing corrects. But that doesn’t mean that just because something hasn’t gone up very much in price - some regions of Canada haven’t gone up that much - that doesn’t mean that they’re necessarily safe, though they’re probably safer. J: Do you think that the Canadian housing bubble is worse than the US bubble in 2006 or do you think it’s not as severe here? S: I think it’s worse. J: Okay, and why do you think that it’s worse? S: Because the size of the debt bubble is bigger despite the myth that Canadians are better lenders than the US banks, and there are no mortgage backed securities and collateralized debt obligations and things like that. There is this idea that it’s the quality of the debt that matters, not the quantity, and because there are essentially no defaults in Canada that the debt is higher quality and not an issue. But debt bubbles don’t work that way. The quantity of the debt gives rise to the the quality of the debt. The more debt you have (versus say, GDP), the worse the quality. Up to a point, the greater the debt growth, the lower the arrears because as they say “a rolling loan gathers no loss”. In other words when debt growth is exploding people can find ways of avoiding default by rolling the loan, refinancing, selling the asset, or whatever. So, paradoxically, the default rate will seem to improve when the actual risk in the economy is exploding. One problem that I have with the Big Short, you know with the movie and the book, while I think they’re great for popularizing what happened, they’ve become almost a caricature of what a housing bubble really is. People think that if a housing bubble isn’t identical to what they saw in the movie, then there isn’t a problem. So if you are in Canada and you don’t see widespread mortgage-backed securities and collateralized debt obligations and things like that, then you think there isn’t a problem. People think that MBS and CDOs are what caused the US housing bubble, and that’s really not the case. So that is, I think, one huge thing that Canadians miss. From my point of view, mortgage backed securities and collateralized debt obligations and all those things were not at all the cause of the crisis; they were just symptoms of the underlying debt bubble. Canada has its own inventions in the credit markets that I think are at least as dangerous as CDOs but they’re completely different from what we’ve had in the US and so people don’t recognize how dangerous they are. So the size of the debt bubble I think is at least as bad, and the recycling of debt throughout the economy is worse, and because Canada has not had any real credit cycle for the past almost 30 years, people have sort of forgotten what a credit cycle is and so they think that they’re immune to it and better at banking than Americans. So think about it, if you started your career when you’re 22, and for your entire career virtually no banks have ever had credit losses and housing and other assets never really went down, you begin to think that’s due to skill and prudence. So you subconsciously become willing to take on more and more risk because no one’s ever gotten hurt, and no one remembers what a bad credit cycle is like, and so the longer it goes on without incident, the worse the risk taking and lending quality becomes. That’s just the nature of the thing. S: Yeah, the details are complicated…. but for me, at the core, the main thing that credit bubbles share is the amount of debt that’s being taken on and how quickly it is growing. 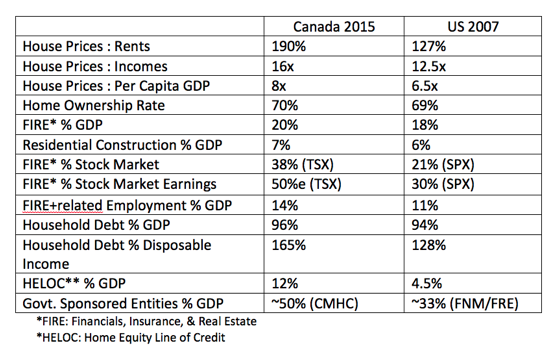 If you look at housing and financial insurance, real estate, construction, consumer spending, as a percentage of the economy, it’s bigger in Canada than it was in the US. Basically any metric that you look at, it’s a bigger bubble in Canada than it was in the US, at least the ones I used to analyze the US bubble at the time. J: That’s scary. I mean it’s one thing to have 1 or 2 charts showing that the bubble’s big, but it’s another story altogether if multiple charts are showing the same thing. S: I have a table - I haven’t updated it in a while - but it’s basically all the things I looked at in the States, so I’m not cherry picking to make Canada look bad, it’s what I actually looked at in the States and I’m comparing Canada to that and, Canada is worse on every metric. J: Now, interest rates have actually gone up in the past few months quite significantly, because I guess the Canadian economy is doing better. Do you think that’ll impact the housing market significantly? S: It could. I mean I don’t think [interest rates] have necessarily gone up because the Canadian economy’s doing better. Globally, interest rates were going up in general. So I wouldn’t read into the interest rates going up being because the Canadian economy’s doing so well. So part of it was global rates were going up and part of it is the Bank of Canada raised rates and that caught some people off guard. If rates keep going up I think that that is potentially a very negative development for the Canadian housing market. And one of the things I look at is the percentage of loans that are adjustable rate mortgages. If you remember from the US people used to say that the adjustable rate mortgages were a ticking time bomb, that if rates ever went up then suddenly people couldn’t afford their mortgages. They say in Canada, we have a much smaller percentage of adjustable rate mortgages. I disagree. I think that 100% of the mortgages in Canada are adjustable rate, because the mortgages are so short term even though they amortize over longer periods. You have a typical US mortgage that is 15 or 30 years, whereas the typical Canadian mortgage is 5 years. So you’ve got somewhere between and 20 and 35% of your mortgage market renewing and they have to take out a new mortgage at whatever interest rate is prevailing every year. So if all the mortgages were 5 years, then 20% of the people every year would be renewing at a higher rate but some of the new more extreme sub-prime lending in Canada, those sort of 1 year, 2 year mortgages, would reset much faster. J: Are those the loans originated by MICs, by mortgage and investment corporations? S: Some are MICs, some are alternative lenders, some are direct lending. People in Canada have been borrowing against their home equity line of credit - to lend to subprime borrowers directly. Those are 1 to 2 year loans very often. But the MICs also have the 1 to 2 year loans… many of the larger alternative lenders also have the same. J: I see. So you think if interest rates rise significantly the housing market will be heavily impacted. Do you see any other triggers…? S: Yeah just to be clear, my bet has nothing to do with interest rates. I’m not waiting for interest rates to go up, but if rates were to go up substantially that would be a huge issue for the Canadian economy. I think everyone, even housing bulls agree that if interest rates go up it’s a big issue. Most people I talk to in Canada say the only thing that could derail the housing bubble is if rates go up or if there’s some unemployment shock, so that’s the consensus. J: I see. What are some of the indicators that you’re waiting on? S: The big ones are the tightening of credit and a slow-down of foreign funds, and both of those are occurring as we speak. J: So tightening from the traditional lenders? S: From anyone. Everything happens at the margins. What generally happens is that the worst lenders usually end up being forced to tighten first. We’re already seeing that. Home Capital for example ran into some trouble and it will be challenging for them to return to their prior growth. And, due to some of the government mortgage regulations that were passed last fall, and that will probably be changed again over the next couple of months, it will probably tighten again. J: I see. So are there some long-lasting regulatory changes that are tightening credit at the moment because of Home Capital? S: Yes, I’d say that’s accurate. We will see what the government does. J: Assuming that credit tightens further, what are you expectations of a timeline? You don’t have to give a precise one, but do you think that this will unfold over the next month, or do you think it will take years…? S: No, I mean real estate’s generally pretty slow moving so it can take a year or two to play out, but stocks can also reflect that before that happens, so stocks and other asset markets can correct before house prices have even really been hit or loan losses become obvious. In the US, the housing market started to roll over first and then it fed over to the asset markets, but it doesn’t necessarily have to happen that way. If you look at the Great Depression, the stock market crashed before the real estate bubble burst and before there were any credit losses, so it can go either way. But generally real estate is - if you talk to economists, they consider it to be ‘sticky’, which means it can take time for the real estate prices to reflect reality once the bubble’s over. J: Right, a lot of people just won’t sell their houses if they think the prices are down? S: Yeah they’ll try not to. It doesn’t mean that it won’t crash, but there are a bunch of reasons why real estate could be sticky. Banks could also not foreclose and let people live for free. J: So in the case that the bubble really bursts hard do you think that our banks are safe? S: I don’t think any of your banks, any of your big banks, are going to fail, but that doesn’t say anything about their stock prices. J: Yeah, it’s interesting - I used to work in the risk capacity for one of the big banks and they’re prepared, at least theoretically, for a 50% decline in Canadian housing prices. I can’t remember if that’s regional just for Toronto, or across Canada. S: Yeah, we’ll see about that. J: Yeah, as someone who creates these models, I take those models with a grain of salt, to be honest. S: Yeah, generally people miss the non-linearity of what happens in the down part of a credit cycle, particularly in a down 50% scenario, so the model doesn’t capture that. During the US crisis, there’s the story about the risk manager who came in every day and said it’s a 100 year event or a 1000 year flood, and it happened 4 days in a row. It’s non-linear, and very complicated. When you have a problem of this magnitude and things starts breaking, it’s really hard to model. J: Yeah, I can see that. So can you talk about the way in which you’ve chosen to bet against the housing market, or is that proprietary knowledge? S: It’s generally proprietary, but what I look to do is find the assets that are most exposed to housing and the debt bubble and that also have significant issues separate from the housing market as well. So the ideal thing I’m looking for is not just the bet on housing, they’ve also got their own company or industry specific problems. J: That’s all the questions that I had. Do you have any other comments that you’re aching to share? S: I think that’s good for now. I would like to thank Seth for taking the time to give this very interesting interview. If you’re interested in learning more about Seth’s work, please visit the official website of Libertas Real Asset Opportunity Fund.